Aortic dissection occurs when the wall of the aorta (the major artery of the body) develops a tear, which allows blood to enter the vessel wall, dissecting (or tearing apart) the layers of the wall. Aortic dissection can cause extensive injury to various organs and rapid death, and should always be considered a medical emergency. Aortic dissection occurs when the outer layer of the aortic wall becomes weakened, allowing a tear to form. This weakening is associated most commonly with hypertension. It can also be seen with connective tissue disorders such as scleroderma and with Marfan syndrome, Turner syndrome, Ehlers-Danlos syndrome, traumatic injury (such as occurred with Princess Diana), and with inflammation of the blood vessels. Aortic dissection is also caused by cocaine use. Aortic dissection is most commonly seen in people between 50 and 70 years of age and occurs more often in men than in women. When aortic dissection occurs, blood traveling under high pressure forces itself into the wall of the aorta, tearing apart the layers of the wall. A very large volume of blood can go into the aortic wall, and this blood is lost to the circulation — just as if severe bleeding had occurred. 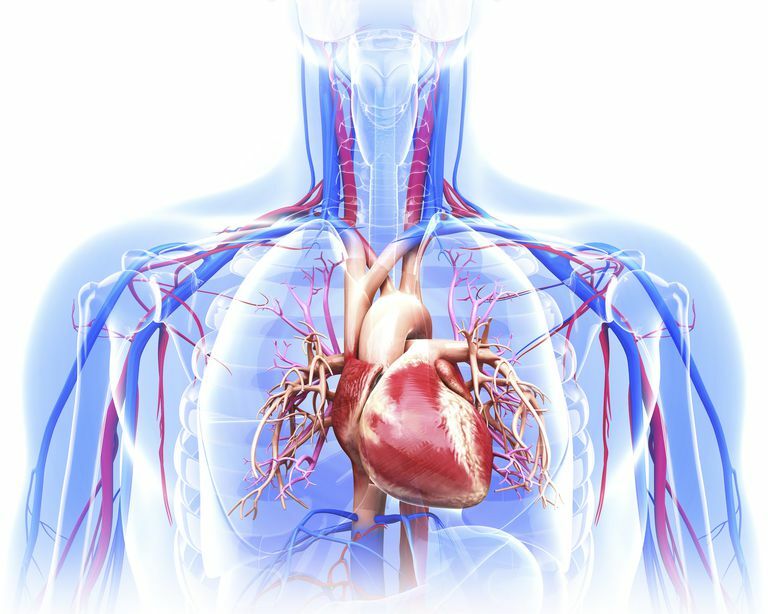 The dissecting blood can travel along the length of the aorta, occluding the blood vessels that arise from the aorta and causing damage to the organs supplied by those blood vessels. Aortic dissection can lead to aortic regurgitation, pericardial effusion, myocardial infarction, neurologic symptoms, kidney failure, and gastrointestinal bleeding. Furthermore, the aortic dissection can rupture the aorta completely, leading to massive internal bleeding. For all these reasons the mortality with aortic dissection, even with rapid and aggressive treatment, is quite high. Most commonly, aortic dissection causes the sudden onset of a very sharp, severe, "tearing" pain in the chest or back, that often radiates to the abdomen. The pain can be accompanied by syncope (loss of consciousness), by severe shortness of breath, or by symptoms of a stroke. Generally, the symptoms with aortic dissection are so frightening and so severe that there is little question in the victim's mind about whether immediate medical help is needed. Treatment depends on which portion of the aorta is involved, and on the condition of the patient. In all cases, patients with aortic dissection are brought to the intensive care unit and are immediately placed on intravenous medications (usually with nitroprusside) aimed at significantly reducing their blood pressure. Lowering the blood pressure can slow the continued dissection of the wall of the aorta. These patients are also given intravenous beta blockers (either propranolol or labetalol) to reduce the heart rate, and to reduce the force of each pulse. This step is also aimed at limiting further dissection. Once the patient's vital signs have been stabilized sufficiently, an imaging study (most commonly a CT scan or MRI) is performed to fully define which part of the aorta is involved. Depending on its location, the dissection is labeled either as Type A or Type B. Type A Dissections: Type A dissections are seen in the ascending aorta (the early part of the aorta that supplies blood to the heart, the brain, and the arms). Type A dissections are usually treated with surgical repair, which usually consists of removing the damaged part of the aorta and replacing it with a dacron graft. Without surgery, these patients are at extremely high risk for aortic regurgitation, myocardial infarction or stroke, and they usually die from such complications. Surgery is difficult and complicated, however, and the risk of dying with surgery is as high as 35%. Surgery is recommended for Type A dissections because the mortality is even higher with medical therapy alone. Type B Dissections: In Type B, the dissection is confined to the descending aorta (the part of the aorta that lies in front of the spine and supplies blood to the abdominal organs and the legs). In these cases, mortality is not measurably better — and may be higher — with surgery than with medical care. So treatment most usually consists of continuing medical therapy, that is, continuing blood pressure management and beta blockers. If evidence develops of damage to the kidneys, intestinal tract, or lower extremities, however, surgery may become necessary. After the acute aortic dissection has been treated, the recovering patient must remain on beta blockers for the rest of his/her life, and excellent blood pressure control is a must. Repeat MRI scans are performed prior to hospital discharge, a few more times over the next year, and every one to two years after that. This close follow-up is necessary because, unfortunately, about 25% of survivors of aortic dissection will require repeat surgery for recurrent dissection over the next few years. Because aortic dissection is at least life-altering if not lethal, it is far better to prevent it than to treat it. You can reduce your odds of having aortic dissection by paying close attention to your cardiovascular risk factors, especially hypertension, and working aggressively to improve your risk profile. Hiratzka LF, Bakris GL, Beckman JA, et al. 2010 ACCF/AHA/AATS/ACR/ASA/SCA/SCAI/SIR/STS/SVM Guidelines For The Diagnosis And Management Of Patients With Thoracic Aortic Disease: A Report of the American College of Cardiology Foundation/American Heart Association Task Force on Practice Guidelines, American Association for Thoracic Surgery, American College of Radiology, American Stroke Association, Society of Cardiovascular Anesthesiologists, Society for Cardiovascular Angiography and Interventions, Society of Interventional Radiology, Society of Thoracic Surgeons, and Society for Vascular Medicine. Circulation 2010; 121:e266. LeMaire SA, Russell L. Epidemiology of Thoracic Aortic Dissection. Nat Rev Cardiol 2011; 8:103. Melvinsdottir IH, Lund SH, Agnarsson BA, et al. The Incidence And Mortality Of Acute Thoracic Aortic Dissection: Results From A Whole Nation Study. Eur J Cardiothorac Surg 2016; 50:1111.